Description: Lop-Ear Looie is one of the Fisher-Price patented Pop-Up Kritters (Patented October 5, 1926-No. 1,601,983) that are made of bead and string construction allowing the Kritter to spring to life when the strings are pulled tightly, squirm and sway around as the strings are loosened, and laying flat when the strings are loosened all the way. Pop-Up Kritters are mounted on a paddle and the control strings have metal loops on the end to allow easy maneuvering. 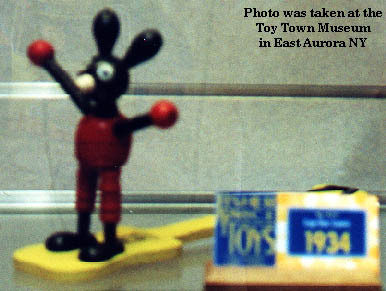 FPT4795 - Lop-Ear Looie - Black wooden bead mouse with a red body, red bead legs, and red hands. Looie is made of beads with string through middles. Looie has a black head with white painted eyes and a white snout with a black bead nose on the tip. Looie has long black wooden bead ears that flop in many comical positions. Mounted on a guitar-shaped wooden paddle. Measures 6" high, 10" long paddle. 1934 retail price was .25¢. Patent No. 1,601,983. Pat date Oct. 5, 1926 by Ed Savage, who later sold the patent to Fisher-Price.